Had the writer Lewis Carroll chosen clay over pen & paper, he may well have created something like the work of Clairy Laurence. 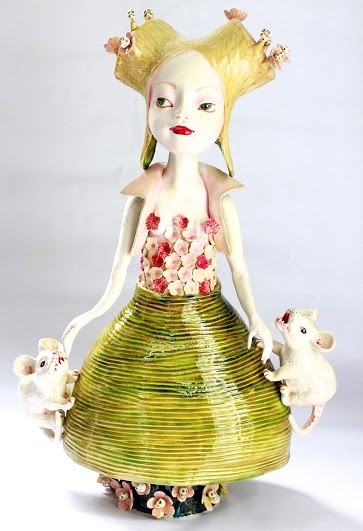 A ceramicist with over 30 years of experience, Laurence uses a combination of hand building and wheel throwing techniques to bring her whimsical forms to life. Born into a family of potters, she originally sought a career in jewellery making, but found herself following the footsteps of her mother and grandfather when she realised she too had a knack for making clay come to life. The minutiae and precision in her current work gives some idea of the potential jeweller she may just as easily become, had clay not been her calling. Her Lil Babes, a series of one-off figurines, are her signature. Small girls adorned with rosy cheeks, pink lips and petal crowns, they appear like delicate nymphs from another world. But look closer and you’ll see the inquisitiveness in their wide-eyed gaze, their expectant faces and open hands. They are like Alice at the tea party, curious and animated by the thought of what may lie ahead. Whether seen together or apart, they seem to capture something of the gothic fantasy and fable seen in the work of Carroll, CS Lewis and Enid Blyton’s Magic Faraway Tree. For The Ambience Store Project, Laurence has also reissued her range of Cabbage Dinnerware, a quirky and beautifully crafted collection of serving bowls, jugs and plates. Displayed together, her work is a gorgeous garden party, full of magic and fairytale. Working from a studio that overlooks the surrounding bushland, Laurence both sculpts fulltime and teaches ceramics to a devoted group of students. The knowledge she possesses continues to be passed on to a new generation of artists, each one spinning their innermost thoughts into the clay they mould. She is a qualified art therapist and worked with the disability community for a decade before leaving to devote her time solely to her own practice. Her work has been exhibited in numerous exhibitions throughout South East Queensland, including shows with Jugglers Art Space, Graydon Gallery and the Queensland Potters Association. You can see Clairy Laurence’s ceramics as part of The Ambience Store Project #5, on view until 1 August 2016.